We live in an age of competition. The number of people seeking work are much larger than the number of vacancies present. Getting a job without references can be infinitely tougher than with one. Nonetheless, it is always better to stick around till one has seen the light of success than giving up without a fight. 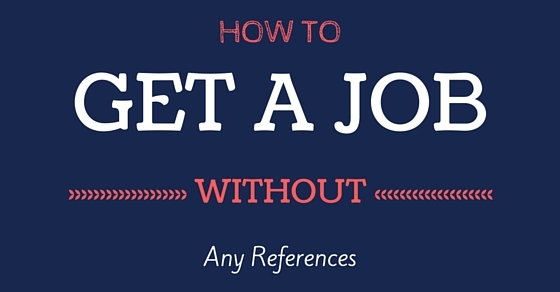 And this article will provide all the tricks on how to get a job without references. Get a Job Without References – What to do? Tutorials are available for a situation like this. Mock interview classes are basically going to help you get used to the questions asked on an interview. It always helps to be one step ahead of others. Taking classes to able to answer questions more effectively multiplies your chances of getting selected. There are free online courses for those of you who are not from a well to do background. However, experience between online course preparations and taking classes in person may vary from person to person. Choosing what is fundamentally the best option is also important. Always have specific plans. Making plans keeps everything from slipping out of hand. A lack of plans always leads to hasty outcome. Knowing what you have to do next is a big advantage for the long run. The best way to plan every step of an interview is to rehearse with yourself. Find out the possible questions that are often asked on interviews. Try to come up with practical and impressive answers that will sweep the interviewers more or less off their feet. Try to pinpoint on the subject in the brief possible way while answering questions. Most of the time applicants talk too much without giving any relevant detail on the matter concerned. So just as in exams, try to cut corners for a short yet effective answer. The interviewers want your point of view. Parroting premeditated answers is not going to get you anywhere. You have to be strictly original. But do not curb answers so much that you do not include points that will vitally help you otherwise. Trust is important wherever you go. Companies will not hire you until you have gained their trust. It is as simple as getting to know about somebody before you can finally depend upon them to work for you. Though work related matters are much more serious it basically has the same concept. To get work you have to win their confidence at the interview. Do not panic if you are thinking that it puts a lot of pressure on you. The interview board has people experienced enough to handpick suitable applicants they can afford to trust. Try to explain what you mean to say in as little as possible. This is an age of fast cars and faster communication. So take little time to answer but do not answer without having thought what to say. If necessary to take spoken english class or appoint a private teacher. The bottom-line is to give full effect to your answers without leaving loose ends. Most of the questions are going to be creativity based. Most of the questions asked first will be in reference to your resume or application. You need to fill out the applications very carefully. There is no scope for mistake. Do not write drawn out sentences that will confuse the interviewers. They look for the important key points in applications. They cannot spend more than 15-20 minutes on a single candidate at an interview when there are so many others. The only way you can get their attention is by submitting an impressive application/resume. Always show confidence in your answers and gesture. Confidence welcomes confidence. One proven way of unfailingly impressing the interviewers is to be outwardly confident. It is impossible for an applicant to answer every question correctly or do everything asked of you flawlessly. Your ways have to be convincing enough even if they do not always get to the solution. Confidence is naturally the way to success. It is the first life lesson one can get when he or she finally steps into reality. Do not write any extra things in your resume other than what is important. Also do not say anything out of context or more than what you are asked. If you do your chances of interacting with the interviewers on a practical level will reduce dramatically. You would be wasting your own time if you talk too much because the interviewers will not have time to ask you more work related questions due to the limited amount of time given to each applicant. Body language is another big issue. Having the right body language is just as necessary as saying the right things. If you speak positively but your body language indicates otherwise it is going to confuse the interviewer. In addition to that, it is a much sought after quality if the work needs you to interact freely with clients. Naturally, dealing with clients becomes a lot easier when they are at ease because of your friendly body language. Experience comes quite handy at times like this. Remember that you do not have any work references so the best possible way to get out of such a disadvantageous situation is to apply for work you are already familiar with. People with experience are always cared for. Companies will always look for more experience people before fresh candidates. It save them the task explaining everything to you from the beginning. Nonetheless, the company will expect you to be more responsible than the fresh arrivals. So that practically does not leave scope for mistakes on your part. Always think about what you need to say before you actually say it. Because most of the time candidates are rejected for speaking unnecessarily and out of turn. Do not ever undercut the interviewer when he/she is speaking. Listen to what the interviewer wants to know. Give your answer based on what they want to know and not what you think they would do better to know. It is after all their area of expertise and acting over smart is not going to lead you to better prospects. Show some humor. Smile when you are answering questions. Most importantly let them know that you are not frightened by their presence. It is normal to be nervous at an interview because a lot of what follows depends on how you open up about yourself. You can either be officious with your answers or be amiably decisive with the way you talk. Either way you will reap rich dividends. Also try a variety of approach on matters. Make a list of things that are going to be useful in making an impression. You have to keep in mind that you will have to look sharp. Not having any recommendation leaves you absolutely on your own. But things can only get better from here. Because, on the bright side you would not need to depend on references to get what you truly deserve. You can completely put your mind into acquiring what you want the most. You have to look better from every angle if you hope to get selected. You are not depending on references so you have to make up for it in every possible way. Most often applicants with the right attitude and in clothes fit for the purpose to do better than those with reference. Companies are not going to hire fools inspite of employment references. Thus, you have to better start improving your game. A uniform defines purpose so what you are wearing is going to play in your favor or against you. Of all the things you are supposed to take notice of, reaching for the interview on time is to be given the highest importance. No one wants a late comer to represent their company. It only shows how irresponsible you are as a person. Even if it is not your fault nobody will want to know the reason. So leave early the day you have the interview. There is no saying how long the traffic may take to clear. So leave with at least 2 hours to spare. In addition to that, getting used to the intense atmosphere with so many other candidates can take time. It may help free your mind to reach ahead of time and gauge what you will be up against. If you think that any amount of nail-biting is going to reduce the tension then you are wrong. Rather it will only take toll on your self-confidence. Keep it in mind that worrying is not going to make things better. However, for people who are extremely prone to fretting unnecessarily it can be an extremely daunting task. For such delicate people thinking things through practically will work for the best. Alternative solutions for stage fright can be listening to music or watching videos that motivate you. If possible try to show your potential employer your previous achievements. If the interviewers start showing interest in you more than they usually do then do not feel shy to talk about your past accomplishments. Carry your documents and certificates just in case. Your endeavors should not fail for the lack of trying. But do not show too much unless they ask you to, after a certain point. Being too eager can be harmful too. Try to know about the kind of reference the company is looking for. Once you know what others are getting recommended for, you can work to improve on the same skills by yourself. Also, you can opt for a small certified course to add to your resume. Most of the time companies look for specific requirements. And there are ways of fulfilling them other than carrying a letter of reference. This also gives you more room for improvement. Without any word of reference, you will need to come up with every possible way to keep your efforts from going to vain. Try to learn as much as possible about the company you are applying to. Take your time but leave no stone unturned in learning about the company. That is the only way to impress your potential employers. If you have an unfaltering interest in their company they are most likely to return the favor. So feel free to dig up all necessary information. Put all your might into writing an extraordinary cover letter. That is the first thing their eyes will fall on. Therefore, you would do better to make it the best piece of writing to have ever come out of you. Highlight the key words for better impact. Try to talk about your achievements but not so much that it starts looking idiotic. Getting a job without any references can be challenging. But while so many people go to great lengths to acquire that much-coveted reference, you can work perseveringly towards your own goal all by yourself. The above guidelines would not only help you through the interview but stay with you as a lesson you will always benefit from.